The file uploader for planning sequence only works with CSV files for now. It also expects that the order of the columns in the CSV file is the same as we have in the aggregation level. The sample working CSV format can be seen here. Before creating a new planning function type, we need to create a new ABAP class where we can implement the logic for the planning function type. 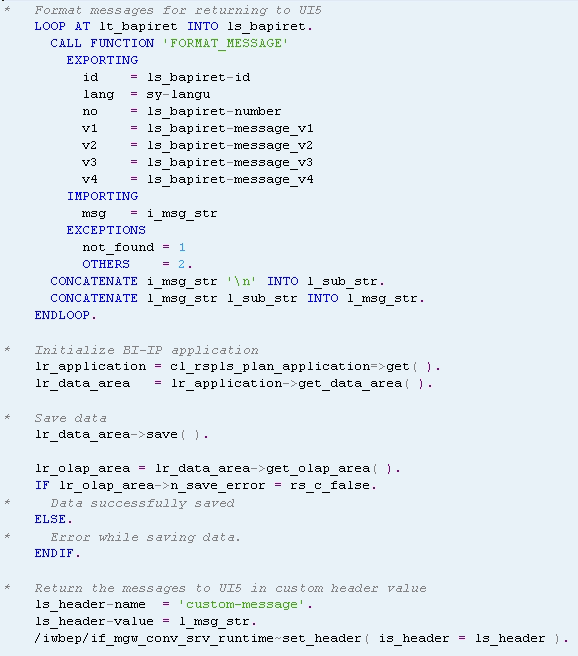 To create a new ABAP class, go to tcode SE24. 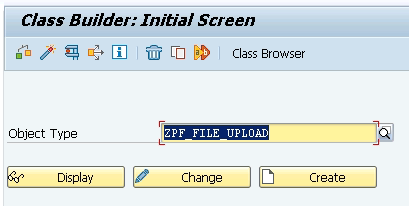 Enter class name ‘ZPF_FILE_UPLOAD’ and click create. Select the object type as class. Activate the newly created class. After activation, go to the Interfaces tab and enter IF_RSPLFA_SRVTYPE_IMP_EXEC entry. Save and activate the class. Until now, we have a custom ABAP class which we can use in our planning function type. 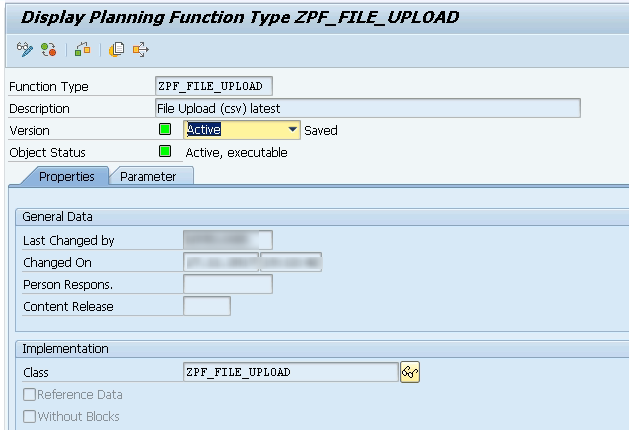 Go to transaction ‘RSPLF1’ and enter the function type name ‘ZPF_FILE_UPLOAD’ and description and click on Create. In the properties tab, enter the name of our custom ABAP class and activate the planning function type. Go to transaction SE24 again and display the ‘ZPF_FILE_UPLOAD’ class which we created earlier. Go to the Methods tab and click on the EXECUTE method. We will write the logic to read the data from the uploaded file from SAPUI5 here. The following code reads the data from a CSV file which was converted to xstring in the gateway service and can be accessed globally from the memory id ‘z_upload_data’. l_t_line          TYPE TABLE OF string. import base64_xstring to l_file_content from memory id 'z_upload_data'. REPLACE ALL OCCURRENCES OF crlf IN l_data WITH crlf-lf. SPLIT l_data AT crlf-lf INTO TABLE l_t_data. create data l_r_output_line LIKE LINE OF c_th_data. READ TABLE l_t_data INTO l_s_data INDEX 1. SPLIT l_s_data AT ',' INTO TABLE l_t_header. LOOP AT l_t_data assigning <l_s_data> FROM 2. SPLIT <l_s_data> AT ',' INTO TABLE l_t_line. LOOP AT l_t_header assigning <l_tab_data>. read table l_t_line index SY-tabix into l_t_column. ASSIGN COMPONENT <l_tab_data> of structure <l_s_output> to <l_field>. MODIFY table c_th_data from <l_s_output>. The complete code for the class can be found on this link. Create a planning sequence and select the aggregation level, filter and planning function created above. Until now, we have an implementation of a custom planning function which is now being used in the planning sequence we created. We will now call the planning sequence from the gateway service and execute the planning sequence. 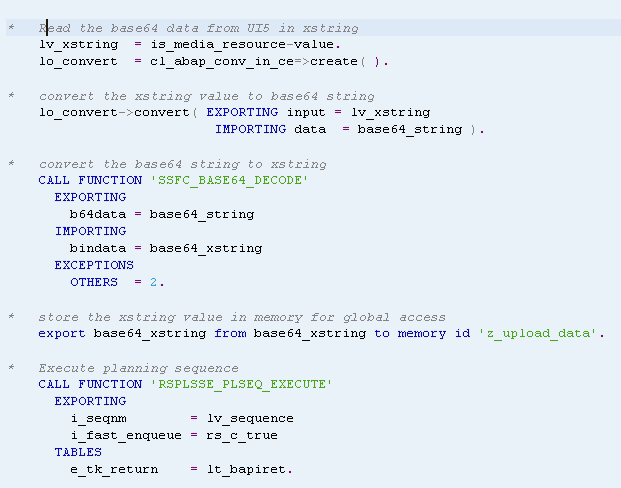 The following code executes the planning sequence and returns the messages/errors in the lt_bapiret table. We will format the returned messages from the ‘RSPLSSE_PLSEQ_EXECUTE’ function and then return them to SAPUI5 and save the data to our InfoCube. After executing a planning sequence, the returned messages will look like this on the SAPUI5 frontend. Adding support for file upload from other file formats like excel, text file, etc. Adding validations for correct order of columns in CSV file, InfoObject validations, correct file format/encoding, etc. In this series of blogs, we looked at how to call a planning sequence in general and execute the underlying planning function from SAPUI5. I also explained how to do a CSV file upload into BW-Integrated Planning from SAPUI5 frontend. I hope it will help a lot of people who are looking for a solution to connect the SAPUI5 file upload for the plan data in BW-IP or BPC. I am looking forward to your feedback. Actually this one is become popular between online games due to its hack tools a huge number of players for http://freerobuxgenerator.net/ have playing this outstanding place of unlimited fun.